On Saturday morning there was a forum with U.S Congressman Dr. Ami Bera (D - Elk Grove) and Elk Grove Mayor Steve Ly at Elk Grove City Hall. The meeting drew a large audience filling the council chambers with participants having to stand in the foray and watch the meeting on screen. From the start the forum was plagued with last minute changes and miscommunication. Rather than taking questions from the audience as planned, they switched to comment cards to try an accommodate the overwhelming crowds. With Councilman Darren Suen selecting the questions to be asked ask from the cards; the spontaneity of the questions asked was compromised. Additionally, there was a lack of communication as to what the cards were for, and it was after the event got underway that it was revealed these cards were how they would be taking questions. The event could not go over an an hour, as a second meeting was scheduled for the room at 12:30 and they started 15 minutes late, severely limiting public discussion. Before the forum got underway, activists in the crowd passed out fliers on issues that Bera, now in his third term, had voted for that differed from the Democratic Party line. Despite the event format, several people spoke up at various points to demand answers from Bera and there was a general consensus from much of the audience that they were there for was Bera, not Ly. Consequently, the questions went exclusively to the Congressman, and when Suen tried to direct a question to Ly, the crowd jeered until he was forced to redirect back to Bera. 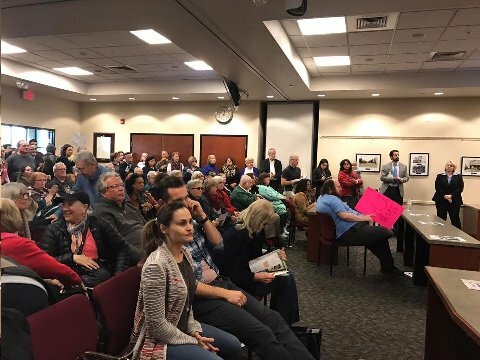 Bera was evasive for most of the meeting, sticking to Democratic talking points and skirting questions about how his votes in Congress differed from what he was saying. When discussing his dissent with Donald Trump’s executive order to ban refugees from select Middle Eastern countries, the crowd asked about his vote to limit refugees from Syria and Iran. After repeatedly dodging the audience's question and receiving pushback, he finally responded that the bill was for additional screening of Iraqi and Syrian refugees. When one member of the audience informed him that the refugees already go through two years of thorough screening, Bera appeared agitated and stated that he’d already answered the question, and gave no further explanation. When talking about protecting California’s sanctuary cities, the audience brought up a vote he made to punish sanctuary cities, which he refused to comment on. Much of the forum was spent with Bera’s criticism of President Donald Trump and the Republican majorities in Congress. When discussing his disappointment with Trump’s appointees and talking about how he is trying to convince the Republicans to reject them, one person brought up that Senator Diane Feinstein voted to confirm all of Trump’s appointments and that he should be talking to her; which he also refused to comment on. He also repeatedly brought up working with any Republicans who are more receptive to opposing Trump’s agenda, but failed to clarify who he meant when repeatedly questioned by the audience; before dismissing further questions by saying he didn’t want discuss campaigns at this point. Congressman Bera also discussed his disappointment with Trump’s hire freeze on federal staff, and specifically addressed how it would affect veterans. When one veteran stood up and asked how he planned to stop it, Bera did not have a response, and just expressed his displeasure with the order. When promising to protect the Affordable Care Act, he was asked by several members of the audience about single payer health care, but refused to commit to it as a viable alternative. Bera made reference to Russia, fake news, and alternative facts blaming them for the results of the election and suggesting he is considering a bill to address the epidemic of fake news. He also stated that no one could have predicted that Donald Trump would win the election, and expressed his displeasure in referring to him as President Trump. Congressman Bera did express his desire to work with Donald Trump on infrastructure spending, but expressed concern with trying to privatize roads and bridges. While acknowledging that Democrats lost the rust belt and receiving criticism for supporting the TPP, he refused to drop the trans-pacific partnership, citing concerns over 8,000 jobs in Sacramento that rely on trade with overseas markets. After the forum, Congressman Bera and Mayor Ly were questioned one on one. I asked the Congressman on his no fly no buy policy on guns, and if he would still advocate for the bill despite it overwhelmingly targeting middle eastern peoples. He maintained his support for it, but when further pushed did admit that maybe the no fly list was a bad idea. Ly was questioned about the Wilton Rancheria casino project, specifically how many permanent jobs it would create and whether or not they would be union. He responded that it would create about 2,000 new jobs and that he is pushing for them to be union jobs. When I identified to Mayor Ly what outlet I was writing this piece for, he accused of ElkGroveNews.net of pushing alternative facts and said we should be neutral and cover both sides. Given his in the forum with Councilman Suen about how great it was that all the heat was on Congressman Bera and that he should come to more of their meetings, I can only say the role of a strong press in our democracy is to hold our governmental bodies and elected officals to account and apply heat as needed. Reporting the City Council's perspective isn’t news, it’s spin, but I would be happy to sit down with the Mayor for an interview any time. Just don't expect it to be sugarcoated.